In 3rd century BC, a conglomeration of Celtic tribes migrated from Europe into central Asia Minor, eventually founding their own realm of Galatia, the “land of the Gauls.” Due to their central location, Galatians factored in local power struggles, often opposing Rome. Of particular note was Manlius Vulso’s infamous 189 BC genocide at Mount Olympus. Tens of thousands of Galatian men, women, and children were massacred by Romans, with a similar number of survivors enslaved. Seeking retribution and possessing innate leadership and military skills, Deiotarus mustered an army that expelled Pontus from Galatia. Next, he challenged Mithradates’ forces in nearby Phrygia and Cilicia. As Fortuna would have it, he now shared a common goal with Rome. Over the next couple decades, the Galatians supported the Romans in a series of wars against Mithradates and his Armenian ally, Tigranes the Great. Eventually, Deiotarus achieved his revenge; Mithradates and his Pontic Kingdom were terminated. For his efforts, Deiotarus was acknowledged as King of an expanded Galatian realm. To celebrate and advertise his status, Deiotarus issued coins, such as this extremely rare bronze struck sometime in mid first century BC. Unlike the abstract artistry employed by many other contemporary Celts, Galatian designs reflect Hellenistic influence. On this coin, the obverse depicts a laureate Zeus, and the reverse an eagle standing on a thunderbolt. The eagle was also an important symbol to the Romans; for example, each Roman Legion bore a standard displaying the raptor's image, known as the Aquila. It is interesting to note that Deiotarus’ forces eventually formed Rome’s Legio Vigesima Secunda Deiotariana (the 22nd Deiotaran Legion). 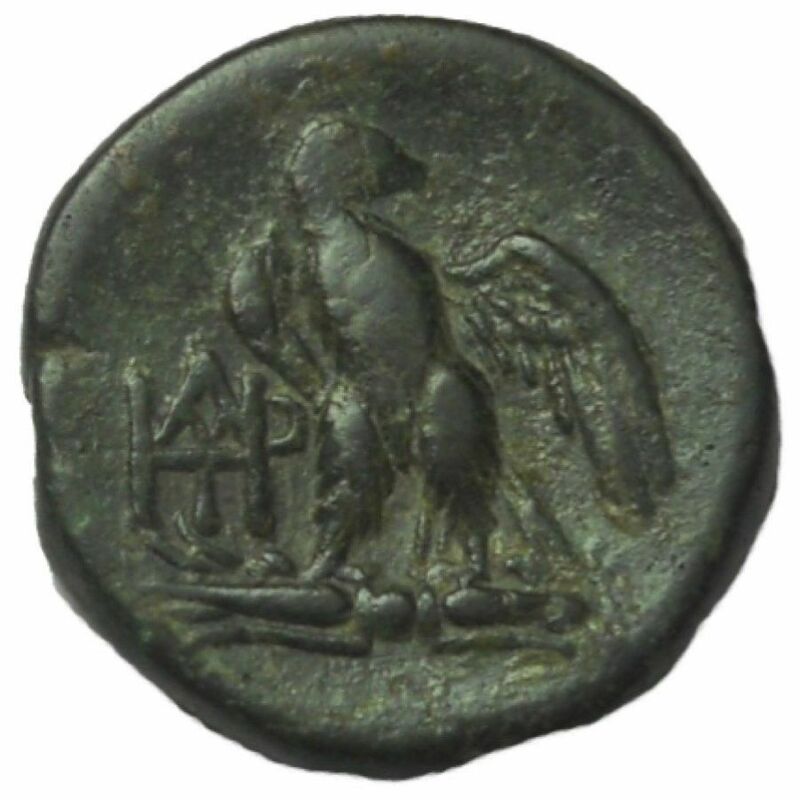 In addition to the eagle, the coin’s reverse also depicts Deiotarus’ monogram, completing the association of the Galatian leader, his forces, and their loyalty to Rome. Despite his track record supporting Rome, Deiotarus’ situation turned precarious when the Republic plunged into civil war. In particular, the Galatian King was renown as friend to Pompey the Great, who ultimately opposed Caesar as Rome’s dictator. After Pompey's demise, Deiotarus was summoned and brought before Julius Caesar on accusations of a murder plot. Luckily for Deiotarus, coming to his defense was none other than Marcus Tullius Cicero, one of Rome’s all-time greatest lawyers and orators. Circero presented a brilliant speech that provides fascinating reading, as illustrated in the following excerpt. Pardon Deiotarus, pardon him, I entreat you, O Caesar, if he, though a king, yielded to the authority of that man whom we all followed, and on whom both gods and men had heaped every sort of distinction, and on whom you yourself had conferred the most numerous and most important honors of all. Nor, indeed, does it follow that, because your exploits have thrown a cloud over the praises of others, we have, therefore, entirely lost all recollection of Cnaeus Pompeius. Who is there who is ignorant how great the name of that man was, how great his influence, how great his renown in every description of war, how great were the honors paid him by the Roman people, and by the Senate, and by you yourself? He had surpassed all his predecessors in glory as much as you have surpassed all the world. Therefore, we used to count up with admiration the wars and the victories, and the triumphs, and the consulships, of Cnaeus Pompeius. But yours we are wholly unable to reckon. True to his reputation, Cicero successfully defended Galatia’s King, stressing that the alignment with Pompey was to protect the authority of the Senate, the freedom of the people of Rome, and the dignity of the Republic (not to mention the savvy Cicero simultaneously manages to flatter Pompey and Caesar). Interestingly, Caesar invoked these same traditional Roman values as he launched the civil war that led to his establishment as Rome’s strongest dictator ever. On the ides of March 44 BC, Caesar was famously murdered, and Deiotarus became embroiled in the tumultuous aftermath. Deiotarus ensured his continued rule with a reportedly large bribe to Caesar’s ally, Mark Antony. Subsequently, Deiotarus provided support to Caesar’s murders, notably Brutus and Cassius. However, after the latter duo fell at the Battle of Philippi, Galatia changed its allegiance in favor of Caesar’s heir, Octavian. Deiotarus ruled over Galatia until his death, sometime around 40 BC. A quindecennium later, Octavian incorporated Deiotarus' Kingdom as a Province, and, for the next several centuries, the Galatians steadfastly strove for the glory of Rome. Additional Reading: M T Cicero “Speech in Behalf of King Deiotarus,” 45 BC. Coin Details: KINGDOM OF GALATIA, Deiotarus, Circa 62-40 BC, Æ (18-19 mm, 6.2 g), NGC Grade: VF, Strike: 5/5, Surface: 4/5, Obverse: Laureate head of Zeus facing right, Reverse: Eagle standing left, head right, on thunderbolt; monogram to left, References: E.T. Newell, Un monnayage de bronze de Déjotarus 2; SNG France -; RPC I p. 356, 2. You say this coin is extremely rare. Can you put that in context for me? That is a very good question, and tt is difficult to answer for certain. I can't seem to find a definitive reference on that (if anyone has any idea, please post, especially anyone with access to RPC vol 1, which I am sadly missing). 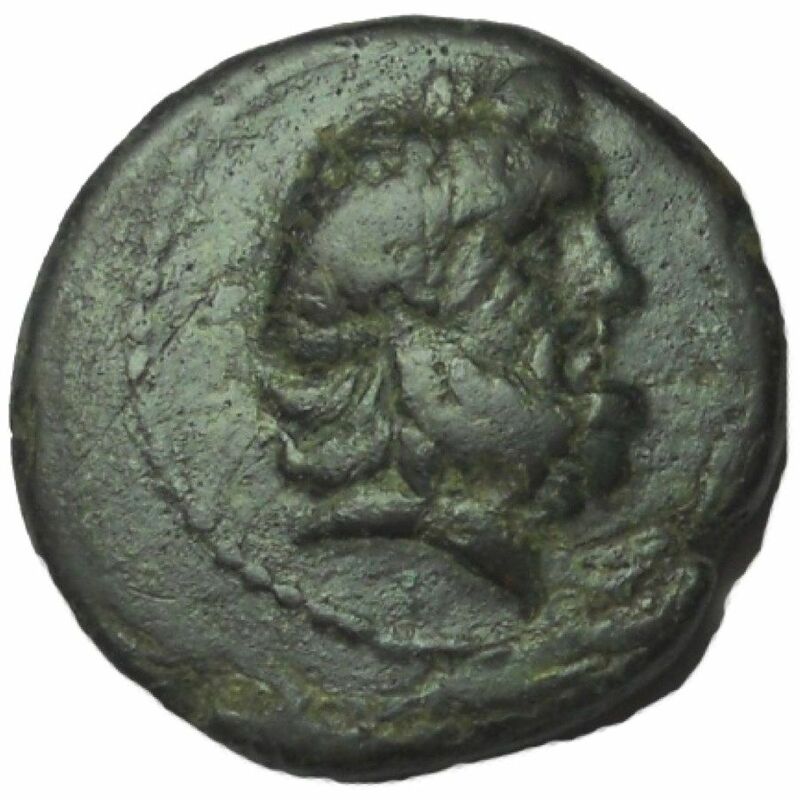 I did search Coin Archives, a popular auction site for ancients, and, assuming I did the search correctly, I didn't find a single example of a Deiotarus coin (of any type) ever recorded being sold at auction, which surprised me . 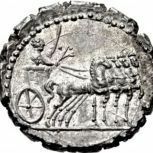 I searched Vcoins and MA-shops, which are perhaps the two most popular website for selling ancients, and at the moment for sale I found only a single coin for sale on the former site (similar, but not exactly like mine since that coin did not have the reverse monogram, which at least for me is extremely desirable), and I found no coins of Deiotarus' for sale at the latter site). It is hard to put in context...for what it is worth, I own a coin of Sejanus', and there are supposedly only 17 of that coin in existence, and I found more examples in auction than i did for Deiotarus' coins.. So, while I can't know for sure, I would say Deiotarus' coins are "extremely rare", I've only ever seen one with the reverse monogram, and I purchased it! It sounds like you made a great purchase!!! !